Americans are eating more cheese than ever - more than 30 pounds a person per year - and their appetite for more variety is growing, a national survey says. In 2003, Americans ate a record 8.8 billion pounds of cheese. That's two and a half pounds a month for every man, woman and child, according to a survey released Tuesday by the California Milk Advisory Board. Most of the demand is being fed by domestic suppliers, and California's mega-dairies are growing so fast that analysts expect the state to overtake Wisconsin in cheese production within two years. California is already the nation's leading milk producer, and with the help of cheese makers like Hilmar Cheese Company -- the largest in North America -- the state has doubled its cheese production in the last decade. 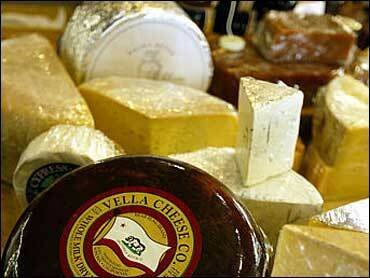 In 1995, California made 70 varieties of cheese. Now there are 250 types of cheese coming out of the state - 815 million pounds of specialty flavored, rinsed, aged or fresh cheese per year. The vast majority is commodity cheese, but Americans are also consuming much more specialty cheeses. Blues, sharps, aged varieties and fresh ones have grown five times as fast in the last decade as the cheddars and mozzarellas, the research showed. One out of every 10 pounds of cheese eaten is a higher-quality, value-added cheese such as artisan or farmstead varieties. Ten years ago, only one in 15 pounds of cheese consumed was specialty. "People are traveling more, experiencing some of the cheeses in Europe, then looking for those cheeses in the U.S.," said the board's spokeswoman, Nancy Fletcher. "They are more adventuresome." It's good news for California dairies, said Chuck Ahlem, a third-generation dairyman who had a bright idea back in the 1980s, difficult years for dairy farmers. Ahlem and 11 other farmers in the fertile Central Valley realized that the area had the world's largest Jersey cow population. By pooling their resources, they could turn some of the high-protein, high-fat milk coming from their brown cows into cheese, a value-added product that would bring in a little extra cash. When they started the Hilmar Cheese Co. in 1984, the 12 families together brought in 250,000 pounds of milk a day - a drop in a bucket for a company that now processes 10 million pounds of milk a day from more than 270 producers - about 10 percent of all the milk produced in California. All that milk goes into 450 tons of basic cheeses like Monterey Jack and Cheddar, every single day. "We were just glad to be in business back then," said Ahlem, who says he was as surprised as anyone by the nation's immense and still-growing appetite for dairy products. The state's increasing milk production has meant tons of cheese -- and profit -- for the once small operation, which has grown an average of 21 percent more each year for the last 19 years, said John Jeter, president and CEO of Hilmar Cheese Co.
"Cows never take a vacation, they don't shut off, they don't take holidays," Jeter said. Hilmar products also are used in frozen dinners, fast food and baked goods, and whey -- the liquid byproduct of cheese making -- which is used for infant formulas and protein drinks. "People are eating more pizza, going out to eat more, and the demand for cheese has increased significantly," said Michael Marsh, CEO of Western United Dairymen, whose members produce 60 percent of California's milk. America's hunger for cheese was dampened a bit when consumers traveled and ate out less following the Sept. 11, 2001, terror attacks. Now their appetite is back, which is good for the dairy business, but hard on already expanding waistlines. Cheese has great nutritious value, and brings calcium back into diets that have substituted milk for sodas. But it also makes food taste better, making it easier to eat too much, said Judith S. Stern, vice president of the American Obesity Association. "It's terrific that we're eating more cheese, but bottom line, all calories count," said Stern, who also teaches nutrition at the University of California, Davis. She suggests people should "try to eat cheese in slightly different ways, with pears or apple slices -- expanding your diet."